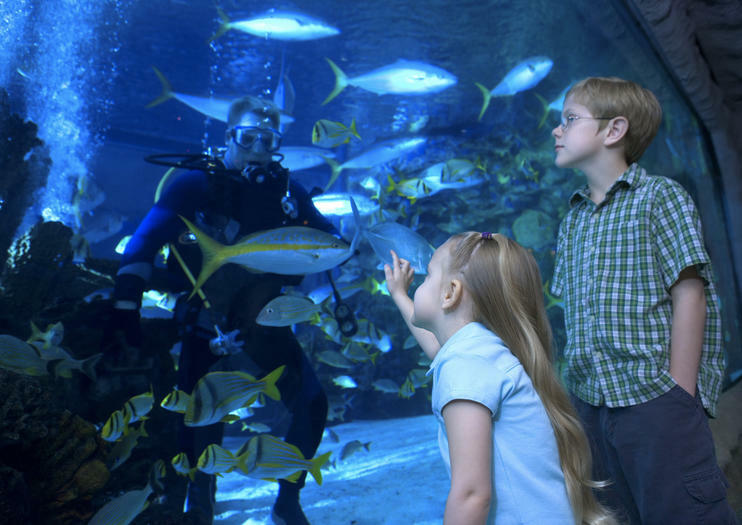 Beyond anything you’d expect inside a mall, at Sea Life Aquarium Dallas you can immerse yourself in the oceanic environment filled with sharks, sea turtles, stingrays, clownfish, jellyfish, touch tanks, and more. Visitors of all ages will love walking through the 360-degree ocean tunnel, watching fish swim overhead. Sea Life Aquarium is part of a worldwide group of aquariums offering smaller-scale aquarium experiences that allow you time to visit several area attractions. You can explore the aquarium on your own, watching daily feedings or special talks about sharks, rescued turtles, and other animals, or take a behind-the-scenes tour to learn more about the animals who live here. The Interactive Rockpool exhibit allows visitors to touch sea stars, crabs, sea urchins, and more. Save money and time by buying your Sea Life Aquarium Dallas tickets in advance. Check the aquarium’s schedule for upcoming talks and special events. The facility is wheelchair accessible, and wheelchairs are available for rent at the Grapevine Mills Mall Guest Services booth. Guests may bring strollers if necessary, but double strollers are discouraged. No food or drinks are allowed inside. Sea Life Aquarium Dallas is located at 3000 Grapevine Mills Parkway in Grapevine, Texas, at the Grapevine Mills Mall, across from Legoland Discovery Center. From the DFW Airport, head south on International Parkway to State Highway 121, then take the Grapevine Mills exit. The mall parking lot is free. A Grapevine Visitors Shuttle runs from downtown Grapevine to several area attractions and includes a mall stop. The aquarium is open from 10am to 7:30pm Monday through Saturday and from 11am to 5:30pm on Sunday. You can anticipate larger crowds on weekends, particularly during school breaks, and over the summer, in addition to spring break, Thanksgiving, and Christmas. If you don’t mind crowds, the aquarium runs several special holiday-themed events, including a Scuba-diving Santa. Sea Life has a breeding and conservation program and helps save injured sea animals. Throughout the exhibits, guests can learn about these programs, including missions to assist with coral propagation and breed, rescue, and protect undulate rays and lined seahorses. The aquarium also helps to educate people about making responsible choices to protect the environment. Discover an incredible underwater world with a ticket to SEA LIFE Aquarium Dallas, where more than 5,000 sea creatures reside. See a horseshoe crab, marvel at translucent jellyfish and stroll beneath sharks in a transparent sea tunnel. Various talks and feedings take place throughout the day, or take a behind-the-scenes tour to learn about conservation and animal rescue efforts. There's something for the entire family to enjoy.